These are just some of the many questions that the elective Melbourne JD subject Institutions in International Lawraised over the course of an intensive two weeks during the winter break. 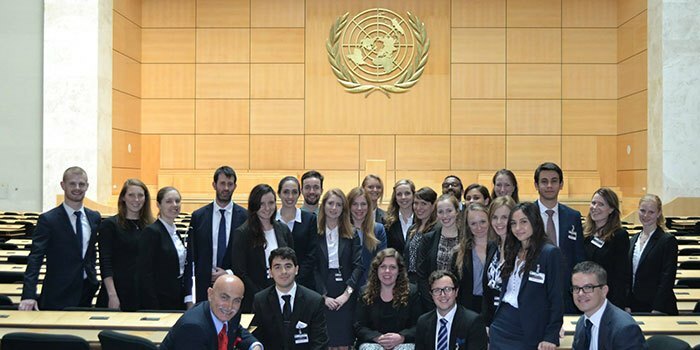 Taking place in Geneva, Institutions in International Law offers students an immersive and intense learning experience in public international law. We had the opportunity to visit and gain insights into a wide variety of international institutions, including intergovernmental organisations such as the World Trade Organization ('WTO') and the World Intellectual Property Organization, and non-governmental organisations that are doing exciting work in emerging fields of international law such as Geneva Call and the Centre for Humanitarian Dialogue, as well as the Australian Permanent Mission to the United Nations and the WTO. The interlocutors from these organisations facilitated complex conversations that gave us an understanding of each institution and its place in the international sphere, the challenges it faces, and the many innovative ways in which these challenges are being addressed. These conversations provided us with much more nuanced and practical knowledge of international law than would have been possible in a traditional classroom. We were exposed to many new concepts and ideas that completely changed my perspective on international law. Many of the people we met also spoke candidly about their own careers and the choices that they had made along the way, giving the subject a practical and career-oriented focus. Another hands-on element, a whole day of simulated land mine treaty negotiation, gave us the chance to test our negotiating skills and was a definite highlight of the course. Institutions in International Law was also incredibly fun! Despite not knowing each other beforehand, the whole group became great friends very quickly. The kindness and humour of our instructors helped create a supportive and friendly atmosphere, making for a very enjoyable two weeks. We had group picnics most evenings and dealt with the summer heatwave by jumping into the refreshing Lac Léman most afternoons. Some people even got up at the crack of dawn to start the day with boot camp! One of the many high points was the picnic that we hosted for all of our discussants on one of our last nights. It was great to have the opportunity to talk to some fascinating people in a more casual and relaxed setting. I am incredibly grateful to Assoc Prof Bruce Oswald, Profs Andrew Mitchell and Tania Voon, and Melbourne Law School for making this subject possible as I can honestly say that participating in Institutions in International Law was the most intellectually stimulating, enriching and inspiring experience of my education so far.